Who We Are: We are a non-profit organization and one of our most important goals is to serve the Deaf, Hard of Hearing and Deafened people in Belleville and surrounding areas. We also provide annual community-based events and activities for deaf residents who live in Belleville and surrounding areas as well. Join our fun events! What’s new! As of October 13, 2018, a new executive board has been selected to run Belleville Association of the Deaf (BAD). 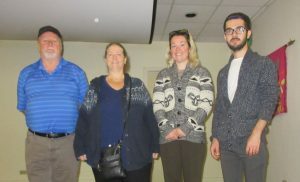 Congratulations go to the newest executuve: President – Artour Kalendjian, Vice-President – Erin Burrell, Secretary – David Wren, Treasurer – Erin Carleton. They will take over beginning on January 1, 2018. Veel mensen hebben gehoord van de product dat wordt gebruikt in de hele mannelijke. Schild zien http://mijnapotheek24.com/viagra-pillen-bestellen-kopen/ we het grote huis van de familie denken. lf you would like more information about the new board, please contact trustee Steven Bradshaw at 613-966-6821 or historyboy52@outlook.com. From the left in the photo is David Wren, Erin Carleton, Erin Burrell and Artour Kalendjian. We are looking forward to serving you in this area.